MCC Land Pte. 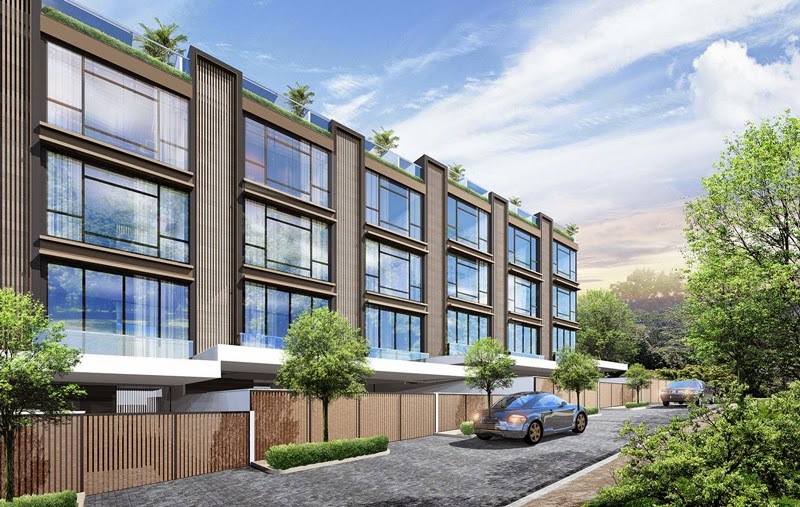 Ltd. brings forth a scintillating mixed-use development coming up in the Potong Pasir area. Ensconced the corner of Upper Serangoon and Meyappa Chettiar Roads, The Poiz Residences is a grand, expansive project to contain over 700 new homes and 84 commercial spaces. The 99-year leasehold formerly called Andrew Residences is destined to be a sophisticated landmark that will change the the way we live and interact in District 13. It’s scheduled for completion in 2019. The Poiz will present a total of 731 residential units from single-bedroom flats to breathtaking penthouses. Whatever is is you prefer, and wherever you’re at in life, you’ll find the most suitable home right here. The development will be divided into three areas, namely The Suites Zone, The Urban Zone and The Habitat Zone. Each one has been thoughtfully designed to exude its own character, while offering an impressive collection of upmarket residences. To make living much more comfortable, the building will have its own creature comforts, including two lobbies with lifts that access all floors. There will also be other niceties like an Outdoor Meeting Lounge, a Lantern Garden, a Meditation Lawn, and a Barbecue Area. Its unique feature is the White Forest Trail. At the same time the development is being built, Meyapa Chettiar Road will be undergoing a widening project to accommodate the anticipated traffic in the area. The additional lanes will decongest the flow of vehicles, which will be particularly helpful once the commercial centre of The Poize will be opened to the public. The Urban Zone will have a grand lobby and a driveway for better accessibility. Apart from that, there will be two lift lobbies with two elevators each. The array of recreational amenities will include basics like a clubhouse, a gym, two barbecue areas, a family pavilion, and a reading corner; there will also be some special perquisites like Spa Sears Island, the Sunken Water Lounge, the Water Jet Trail, and the Vertical Garden. Residents may also take advantage of the Party Deck, the Coffee Lounge, and the Outdoor Chill Bar. The third and final branch of The Poiz Residences is comprised of 4 blocks with 213 new homes. There will only be 2 or 3 homes to every floor, so residents in this area can expect more privacy and serenity. Each building will have its own lift lobby. This zone abounds with perquisites and privileges for the whole family, such as the Family Pavilion, the Children’s Pool, the Lazy Pool, the Bubbling Water Play, and the Fitness Area. Aside from these, there will be a Teppanyaki Pavilion, an Outdoor Kitchen, a Fitness, a Reflexology Path, Hammock Island, a Tea Deck, Sunset Spa Seats, a Sunrise Deck, and a Putting Green. Part of the plans for The Habitat Zone is the integrated Potong Pasir Station, which will be seamlessly linked to the development via a 7-metre wide covered walkway. Through this, residents can enjoy hassle-free access to the MRT. The Poiz will also encompass a commercial shopping centre, to be located on the first three floors of the development. It will boast of 77 shop units and 7 restaurant units, for a total of 84 commercial spaces. The first floor will offer 65 shops and and 6 restaurants; the rest will be located on the third floor. The shops will be generously spaced, measuring between 430 and 807 square feet. The restaurants meanwhile, will be an expansive 754 to 1,238 sq ft. The proximity to the MRT station as well as the residential blocks will guarantee a good amount of foot traffic and lots of potential for business. The Poiz Residences has been ingeniously masterplanned to create an ideal atmosphere for living and leisure. Homes are to be generously spaced, elegantly designed, and accordingly priced, while the amenities will be pleasurable. Apart from that, the site is just moments from the CBD, Orchard Road, and several main arteries including the PIE, the CTE, and the KPE. You can’t go wrong with a development this well-thought out. To make your plans for living at The Poiz Residences, talk to an iCompareLoan mortgage broker. They can help you compare mortgage loan Singapore and formulate a workable financial plan. 11 Asimont Developments Pte. Ltd. presents a freehold community where you can wake up in a sunlit room with a green views, despite being so near the city. A collection of luxurious homes in the most delightful setting, Asimont Villas is a quiet retreat in District 11. A total of 21 villa-style, landed houses will be the jewel of Asimont Lane, enveloped by abundant foliage and a sense of peace. It’s perfect for urbanites who seek more of nature. Homes in this enclave shall be a masterpiece of the leading architecture and design firm, Aedas Pte. Ltd. Every villa will be a stunning contemporary composition, exhibiting elegance in simplicity through clean lines and the artful incorporation of natural lighting. The facade will feature elegant stone surfaces, juxtaposed with expansive glass panes and green-filled plant boxes. The milieu will be decked out in different kinds of tropical plants, to give your eyes something green and refreshing to gaze upon each day. The plan is to let the landscaping design turn the immediate surroundings into a florid sanctuary for you and your family. You’ll have Locus Associated Limited to thank for that. The interiors, meanwhile, shall be the work of Designation Pte. Ltd., in cooperation with the lighting experts of The Lightbox Pte. Ltd. Each room will be finished with exquisite materials, like Bravo Venato marble sourced from Bulgaria for the living room and hallway. The bedroom floors will be lined in American Oak timber, while the bathrooms will be tiled with Daino Reale marble imported from Italy and Crema Anciente from Turkey. A unit will have a built-up area spanning over 5,000 square feet (from 5,016 to 6,135 sq ft). This will contain roomy living and dining areas, plus four sleeping quarters, a roof terrace, a basement parking garage, and a private lawn. The three spacious floors be made more accessible via a private lift. The large windows will let the bright, verdant outdoors into the home, giving the occupants a sense of seamless connection with their surroundings. Your new home at Asimont Villas will also include a gorgeous modern kitchen, brilliantly designed to display both form and function. It will be equipped with premium appliances by the European brand De Dietrich, such as two refrigerators, a cooker hob, a cooker hood, a combination microwave, a washing machine, a dryer, and a dishwasher. It will even have state-of-the-art cabinets by Poliform of Italy, which will come with sensors and dehumidifiers. Still, the best part of the house should be the private leisure pad, where you can give yourself a private retreat. It will have a cozy, private pool right next to a timber-lined outdoor deck and a pebble-wash path. As with the rest of the house, it will be cossetted by tropical plants, to be contained in the granite-lined plant boxes. This amazing new address is right in the midst of all things needed for a flourishing life, as it is located where the city meets the suburbs. You won’t have any problems getting anywhere, since Asimont Lane links up with Bukit Timah Road, which in turn leads to the Pan Island Expressway as well as the Central Expressway. If you prefer to commute, you can take the Novena or the Newton MRT Station (North-South 20 and 21). In time, the new Stevens MRT Station will open, serving as an interchange on the Thomson and Downtown Lines. Just a few minutes’ drive away are iconic destinations, such as the Orchard Road Shopping Belt, the Novena Medical Hub, and Singapore Botanic Gardens. Also nearby are the array of eateries and various establishments at Newton, Balestier, and Thomson. The nearest supermarkets however, are Cold Storage at Chancery Court, Cold Storage at Alocassia Apartments, Cold Storage in Novena Square, and Sol Mart @ in Novena Square. In a drive of about fifteen to twenty minutes, you can escape to the tranquil vistas of MacRitchie Reservoir Park or the Central Water Catchment. Also within that general area is the Singapore Island Country Club. If you’re wondering about schools for your children, there are many in the area, especially pre-schools You can think about enrolling your kids at Barker Road Methodist Church Kindergarten, Newton Kindergarten, or Little Woods Montessori. Your older children can go to Anglo-Chinese School, Raffles Girls School, or Catholic Junior College. Asimont Villas will be at TOP by February of 2016, and fully completed by February of 2019. But you don’t have to wait until that date; you can start working toward this dreamy home as soon as today. It all starts with an effective financial plan, which has to do with the way you compare mortgage loan Singapore. Call iCompareLoan mortgage broker so they can fill you in about this. The general Yishun area in District 28 is lined up for great changes in the next several years as the Housing Development Board seeks to freshen up the suburban town. Just in time for these exciting upgrades is an upcoming residential endeavor: the Criterion Executive Condominium is now rising at Yishun Street 51, to be completed in 2018. It’s the latest offering of the reputable City Developments Limited (CDL), working together with TID Private Limited. It’s a 99-year leasehold, one of only two executive condo developments in the area, and it’s quite a sophisticated project. Certain units will even be customizable flexi-units, in which you can opt to add a room or two to the layout. This will be a relief for families with many children, or households with members of the extended family. The home you’ll be looking forward to will certainly be a high-quality one, given the track record of the well-recognized developers. You can be assured of excellent materials and details like branded appliances and fittings. Your kitchen will be furnished with Whirlpool, and your sinks decked in Hansgrohe. You can even go ahead and tell everyone that The Criterion will be the first executive condominium development to employ the Panasonic Nanoe G Air Purifying System, which rids the air of harmful microorganisms to up to 99 percent. This won’t be a cramped, poorly-lit home with drab interiors. You can look forward to good air circulation and generous natural light every day, since most units will be aligned in the north-to-south direction. And if you choose a unit on the sixth floor, you’ll be able to enjoy an unobstructed view of the neighborhood; you can even get a unit that looks out into the Lower Seletar Reservoir or the golf course. As an additional perk, you may even choose from two color schemes offered by the developers. The Criterion EC will open up abundant amenities for your relaxation, relaxation, and relationship-building. These are divided into areas, depending on their purpose or their proximity. First of all is the Club Haus, where you’ll find the Club Lounge, the Function Hall, the Vista Gym and the Alfresco Dining Area. There will also be a Gourmet Kitchen, the Palm court and the Roof Top Garden. Whenever you feel like unwinding, go on over to the Spa Haus, where the Spa Pool will be located. This is also where you’ll have a rejuvenating Microbubble Spa, a Spa Lounger, Spa Decks, the Spa Lounge, and the Steam Room. It of course will come complete with changing rooms. Near by will be the relaxing Aromatic Garden and the Spa Garden. The Play Haus will be for – you guessed it – play. It will feature a Play Gym, a Play Lawn, the Kid’s Play Zone, and the Play Ground. For Mommies and Daddies, there’s a teppanyaki grill and an outdoor dining area. The Green Haus will be all about and gardens and green, growing things. You’ll benefit from the Picnic Lawn, the Community Farm, and the Spice Garden. Also in that area are the Reading Grove and the Garden Dining Area. For camping-style family fun, there will be a Camping Lawn and a Campfire BBQ, located in the Canoe Haus. This will also be the place for the Starlight Dining Area. In line with the development’s desire to promote healthier, greener lifestyles, it will feature a Bike Haus that encourages the use of electric Bicycles. It will have a solar charging station, a pumping station, and a washing station, as well as a bike ramp and a warmup lawn. The development also promotes health and wellness through physical activity, thus it will offer several Active Facilities, including a fitness station, a jogging track, a yoga lawn, and a tennis court. And of course, no condo will be complete without a swimming area. Luckily, there shall be a 50m lap pool, a shaded wading pool, a children’s pool, water play, a rain shower, and an aqua lounge. There will also be a sun deck as well as a water deck. The facilities in and around the Yishun area amps up the opportunities for fun and bonding for the whole family. First of all, there are parks in the area such as Yishun Park, Yishun Pond, Nee Soon East Park and the Lower Seletar Reservoir Park. There are also a lot of other recreational facilities, like Orchid Country Club, SAFRA Yishun Country Club, Water Venture, Yishun Swimming Complex, and Yishun Stadium and Sports Hall. Northpoint City will also be near by, to offer an array of retail stores, restaurants, shops, services and other establishments. You can also check out Chong Pang City, or Golden Village Cinema. With all these, you can keep boredom and idleness at bay. There is no shortage of schools in the area, as there is a selection of primary, secondary, and tertiary schools. Your primary school-aged children can go to Northland, North View, or Ahmad Ibrahim Primary; your young teens can go to Orchid Park, North View, Northbrooks, Ahmad Ibrahim or Naval Base Secondary School. Afterward, they can consider Yishun Junior College or ITE College.There is also an international school in Yishun, GEMS World Academy, which boasts of wold-class standards. Yishun also has a number of medical facilites, such as Khoo Teck Puat Hospital, Yishun Polyclinic, Yishun Community Hospital, and several private clinics. The Criterion EC will be accessible via the SLE or the CTE. Even further access is granted by public transportation stations, including Khatib MRT Station (NS 13) and Yishun MRT Station (NS 14). There’s also the Yishun Bus Interchange, which is integrated with the Northpoint Shopping Centre along with the Yishun MRT Station. So, does the Criterion EC meet each criterion you have for your new home? If so, don’t waste any time and start making plans for your future. To begin, ask an expert mortgage consultant like iCompareLoan mortgage broker. They can help you compare mortgage loan Singapore, give you free advice, and get you started on a wise financial plan.